On Day 24 we have goodies galore from our friends at Arctic. Get a load of this! First prize includes a Z3 Pro desk mount triple monitor arm, an Alpine 12 Passive CPU cooler, two BioniX P140 gaming fans, some MX-4 thermal compound, and a yet-to-be-released Freezer 34 eSports cooler! There's more. Second prize is a Z2-3D monitor arm, an Alpine 12 CO CPU cooler, an Alpine 12 Passive cooler, two P14 PWM PST CO fans, and MX-4 thermal compound. Spreading the cheer even further, our third winner will also bag a Z2-3D monitor arm, an Alpine 12 Passive cooler, two P12 Silent fans, and another tube of MX-4 thermal compound! The competition winner will be picked at random from all eligible entries that arrive by 09:00 London time on the closing date, January 9, 2019. 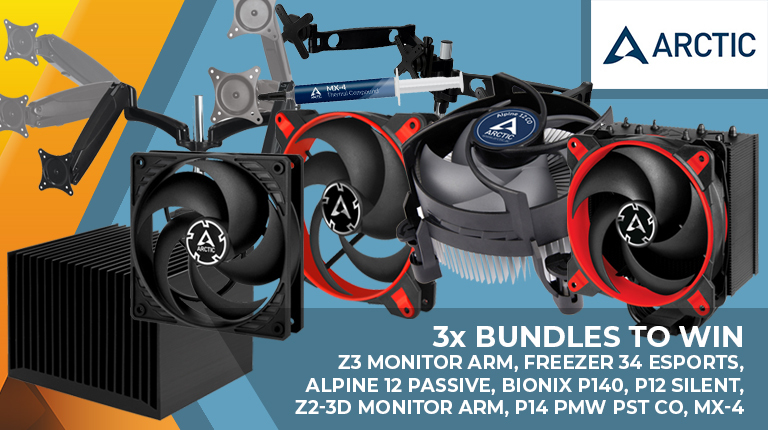 First prize is a Z3 Pro triple monitor arm, an Alpine 12 Passive cooler, two BioniX P140 fans, MX-4 thermal compound, and a Freezer 34 eSports cooler. Second prize is a Z2-3D monitor arm, an Alpine 12 CO cooler, an Alpine 12 Passive cooler, two P14 PWM PST CO fans, and MX-4 thermal compound. Third prize is a Z2-3D monitor arm, an Alpine 12 Passive cooler, two P12 Silent fans, and MX-4 thermal compound. Many thanks to Hexus and Arctic Cooling.